Soleil Westwood is located on the corner of Westwood Boulevard and Wilkins Avenue and has become a fixture in the neighborhood for delicious French cuisine. For over 10 years, owner and Executive Chef Luc Alarie has been offering a variety of dishes, as well as his daily specials. Whether guests decide to stop for lunch, enjoy a relaxing brunch or spend dinner with family or friends, Soleil Westwood has something for everyone. In addition to the delicious menu options, the wine menu and beers of the world selection top off any meal. A cozy lounge with a zinc bar, Soleil Westwood specializes in poutine and other traditional Quebec and French-inspired dishes with a warm and inviting atmosphere. Soleil Westwood also offers catering options upon request. Love this restaurant. Food is always good but Brunch... those Mimosas keep on coming! Ok so much to like, but can I just mention the Fois gras. If you don’t like this dish, then stop reading now. But if you love it as I do, then get yourself over here and order it right now! Perfectly cooked, delicious and tender and succulent, with a sweet little garnish of something perfect and divine. Got a perfect wine suggestion from our waiter which absolutely complimented my meal. And when my friend’s phone ran out of power, they found us a charger! I loved everything about this place and will be back soon. 4.5 stars! Each time the food has been consistently delicious and service attentive but not excessive. Wine by the glass tonight (Pinot noir) delicious and fairly priced. Excellent special (filet mignon and lobster tail) perfectly cooked, with sides that complimented. Lamb rack for partner a bit undercooked yet very good. Didn’t have appetizer or salad—would have been too much food for us. Consistently good food and fantastic service. Luc knows how to take care of you! Love Soleil. Food is consistently excellent and the very reasonably priced for French (Canadian) dining. Pretty atmosphere, diverse menu, friendly service. One of our favorites in LA. Long wait for service, busy but I suppose to few waiters for so many diners. Ceasar salad very So-so. I asked to redo it. Not the real ceasar I expected. Beef Stroganoff was good. House pino Grigio was good. After a 1 hr rush the place died down.... too late for my party of 6. This used to be a neighborhood gem, but the last visit was disappointing. I was dining with a friend. We shared a salad that was lacking in dressing and nuts. When we asked for more dressing, we got something the size of a shot glass half full. I had the duck which was delicious. My friend had fish which was also good. We both had cold potatoes. I'll definitely try again. Everyone has a bad night occasionally, but if it's not better, it will be my last visit. I Love this restaurant. One of my favorites. I have brought friends here and they return on their own. Luc, the owner, is charming and a perfectionist and the staff is very friendly. 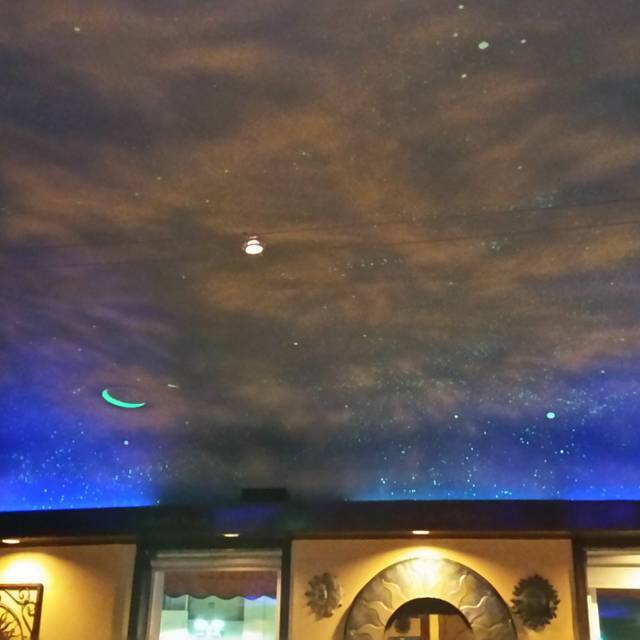 In the evening, there is a lovely celestial ceiling. All in all, a charming and delicious dining experience. The owner Luke walk to tables to greet his customers. The waiters we had were very friendly and food was authentic and exceptionally good. We had Wednesday all you can eat Moules and shoestring fries and dessert we had Creme Brulee "so creamy "
The photo is the interior ceiling decor. I have always wanted to dine here, but for one reason or the other it didn't happen. A colleague visit from Chicago and at work we decided to give a try. It was perfect for the occasion: nice ambiance, a low level of noise, a very attentive female, attending the table without being pushy at all, and great food. Tasty starters, a very well done entree, and a very nice desert as special. Overall, a great restaurant for the purpose.Definitely coming back for the same kind of situation. Comfortable neighborhood place with varied menu and really good food. Loved our meal. Great ambiance and food was tasty. Service was friendly and good. Would definitely return. The menu was interesting but the service and food were only ordinary, nothing special. Admittedly, we were not able to stay for dessert, which might have redeemed the restaurant a bit. May give it another try for brunch and dessert, but dinner was disappointing. Lovely, cozy neighborhood restaurant; great menu, and really good food! They were very nice to our dogs, even brought them dog beds! Cozy place with outstanding food and a helpful friendly staff. Our waiter's recommendations were on point. We ordered the special bouillabaisse and it was divine, full of fresh seafood in a tasty wine broth. The best. The salad du Quebec (Manchego cheese, dates, candied walnuts in a cider vinaigrette) was also memorable. Don't miss the berries in puff pastry and Bavarian cream. We will be returning soon. I was attracted to Soleil Westwood because of both the location and also the creative potential of Quebecoise dining. The ambience was sweet, rather charming. Service was efficient but not especially friendly. The disappointment was in the food. We both ordered lamb shank and it was rather dry. The sauce, however, was very good, and the veggies were cooked very much to our taste and were extremely fresh. Lastly, the scalloped potatoes were on the bland side. Of course, a highlight at a Quebecoise restaurant would be the poutine, but that is actually served next door at a Poutine Bar. The menu there offered Poutine about nine ways, but in the restaurant, there was no reasonable way to at least have a small taste: I believe a half-order was allowed, but it was pricey at $9 if a diner just wanted to have a taste! That was a disappointment too, and didn't feel customer-friendly, especially about enabling the regional specialty at a specialty restaurant! It is a neighborhood restarting that we thought we would try. I love French food and the food was good not great. I'm sure I would have enjoyed it more if it wasn't for the fact our waiter was bit attentive. First the host that sat us seated us and didn't bother to hand us the menus. Just put it down in a stack and walked away. Our waiter didn't ask if we wanted Parmesan cheese for my pasta and it came in a shaker not hand grated. I drank both my water and my girlfriends and both empty never filled until asked too. Didn't come back once food wa delivered to inquire if we needed anything or if everytu My was good. My friend and I meet here for dinner at least monthly. I think their dinner menu offer anything I may want. Their rose salad is great, they have a nice, reasonable wine list, make excellent Negronis and their staek with peppercorn sauce is always good. So are the french Fries. Wednesday night is their all you can eat mussel/fries night but they need to know that's what you want 24 hours in advance. Service is very good, prices are reasonable and it's not too loud to have serious conversations. This is my default restaurant. It's not fancy but warm and comfortable. The food and the service are wonderful. Steaks melt in your mouth and so very tasty! We love this restaurant. 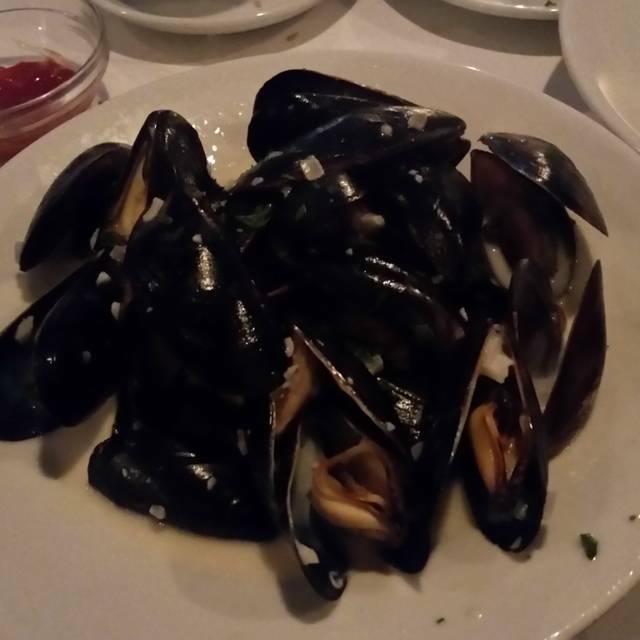 We went on Wednesday for all you can eat mussels. 4 very different sauce choices: spicy red, curry, and original were fabulous. Service was wonderful. A wonderful neighborhood gem offering valet parking as well which is a necessity for my group. Excellent attentive service and low noise level. Good value as well. The dishes were fabulously delicious! The service and staff were fantastic and the owner, Luc is always nearby with a smile on his face greeting his guests. He's also always there for hello and sometimes to offer up complimentary mini chocolate desserts or fruit. He's a gem! I hope Soleil will be there forever! I love this place. In a world where everyone loves to brunch it's nice to come to a place that's quiet and quaint. My spouse and I come here for brunch all the time. They have bottomless mimosas or bloody Mary's for $15 (you can get much better than that). Also the smoke salmon omelet is to die for. I would def recommend this place. Discovered this little neighborhood cafe within walking distance of our hotel. Ended up there on Bastille day, which was extra fun! So good for dinner, we wandered back over for Sunday brunch before we left the city. There were friends getting together, family celebrations, and kids enjoying dinner out...we loved the cozy local atmosphere and the warm hospitality. Food was great, from appetizers to dessert. So glad we found this place! Very nice place if you want a slightly fancy lunch. Good service and tasty food. Our group of 6 got a 20% discount for checking in on Yelp. (Oops, should I say that on Open Table?) Yummy flourless chocolate cake and creme brûlée. Tasty chicken crepes, good sandwiches and fries. Came here for brunch on a Saturday around 10:30 am. No wait and we were seated right away! I had salmon eggs benedict, which was good. The fries were skinny and crispy, just the way I like them. Service was outstanding! I would definitely like to go back and try all of the poutine. We were in Los Angeles visiting our kids and grandkids for Father's Day weekend and went to Soleil that Saturday night. We had no difficulty getting a reservation, but the small restaurant was full of diners. We shared multiple menu items and loved all of them, and the service was impeccable, if not just a little impersonal (which was different from previous visits). Valet parking was available and they even kept our car out front after we finished dinner to give us time to run across the street for our favorite ice cream. Evening was spoiled at the end by customers who arrived after my party who complained that we were "too noisy". We were tucked away in the corner which probably caused our voices to echo. The other party (4 in total) were just as loud. Next time we will stick with Petit Soleil. Consistently good. Almost always have mussels. So nice to be in a restaurant where we can actually hear each other. Food is very french. there were 5 of us and we all enjoyed our meal. Everything was great about this restaurant especially if you like french food. Drinks were also good. I had the duck which was moist and crispy which is a difficult thing to do. My friend had the salmon which was also excellent. The waiter was friendly and helpful and when we said we had to be out at a certain time to make a show they made it happen but you didn't feel rushed. We came here for Saturday bunch and bottomless champagne. Food was ok. Service was good. Nothing spectacular but hey I probably have high standard..
We were there for brunch on Saturday. The food was ok, not great. But the menu was pretty broad. The service was ok but not at all friendly. The restaurant decor could use some refreshing &/or updating. Celebrating 2 birthdays. Everyone enjoyed their dinner and had a good time. The service was good. We have dined here a couple of times. Casual dining experience with good food and service. I love the Escargot. We will be back again. Our family enjoys Soleil always. The owner is charming and the food delicious. We've been going there for over six years. I prefer their fish specials and my daughter the beef bourguignon. It is wonderfully under-stated in its approach. A great place for a special occasion family dinner and will be sure to please everyone. I have been to Soleil before and always enjoyed the Eggs Benedict. I was meeting a friend who I hadn't seen in awhile and suggested we meet here. She had never been and I thought she would enjoy it. No surprise - the food was great (Eggs Benedict). Service wasn't as great. Never asked if we wanted refills on the coffee or to check to see if everything was OK. Brought the check without ever asking if we wanted anything else..I.e. dessert. We did share a dessert which was yum. Service is part of the ambiance. Bad service can ruin a great meal.